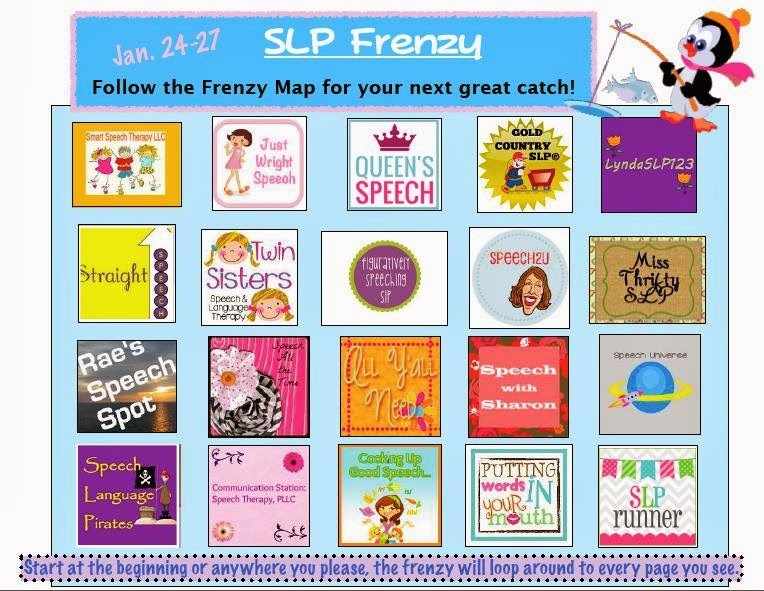 I am so excited to be able to participate in another awesome SLP Facebook Frenzy! What is a Facebook Frenzy you ask? Well, 20 awesome SLP bloggers/TpTers are offering you a freebie on their Facebook pages. All you have to do is go to their page, click on the SLP Frenzy tab, and follow instructions to grab your freebies! Here are the awesome SLP's that are participating in this Frenzy. Click on this picture below and it will take you to a map where you can click on any button to start collecting your freebies! This frenzy runs from 8:00 am (EST) January 24- 10:00 pm (EST) January 27, 2014. That is four full days to collect all of the great freebies! As an added bonus, I am also placing all of my winter themed products (including my articulation and language calendars) on sale for 10% off during the frenzy! You can check out my TpT store HERE.